In Ancient Rome, the dye that created purple was so expensive that only members of the ruling elite could afford to wear it. 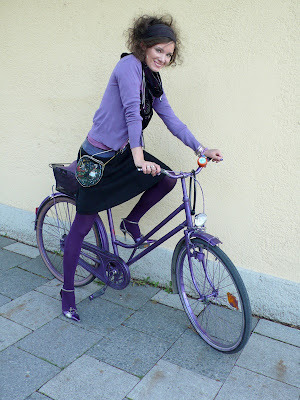 Nowadays, anyone can go out decked in violet, but I have never seen someone quite as enthusiastic about a colour as this stunning German. Even her hair is dressed in pseudo-Classical fashion, reminding me of the royal femmes who wore Tyrian purple two thousand years ago. I think she deserves an honourary feature in Purple magazine. P.S. While I'm on the theme of vivid colours, Chloe Sevigny (who happened to be featured in the most recent issue of Purple) looked glorious last night in a tangerine silk mini and satin t-straps. The contrasting pink clutch is an inspired touch and makes me think of India, where pink and orange are frequently worn together. The only dress I can think of that compares with this is the famous blood-orange toga gown by Hermes, but I prefer Chloe's Prada mini. Posted by la femme at 7:35 p.m.
Oh my gosh! I love the purple girl (and Chloe, but purple girl is a real find). 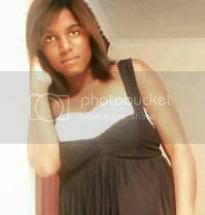 Ah, I really enjoyed this dress on her as well. 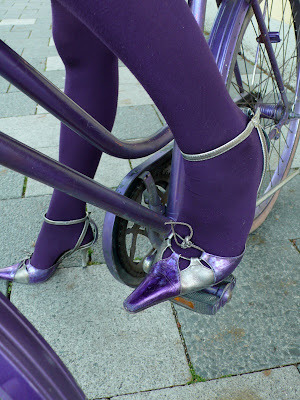 I love purple especially those tights. i love the purple girl! Such a great outfit and use of color! wow the purple girl looks so cute hehe! so gorgeous, whether it's the purple vision or the tangerine dress. Bright orange and pale pink is one of my favorite color combos, even if it is on Chloe Sevigny.